Yesterday Carr Properties and Clark Construction Group, together with Maryland Governor Larry Hogan, representatives from Montgomery County, Insight Development, and other project team members, joined together at a ceremonial groundbreaking for Carr’s 7272 Wisconsin Avenue project, a 937,000 square foot mixed-use development project that will include office, retail and residential space. The well-attended event included distinguished guests from the Maryland Transit Administration; Montgomery County government; the project architect, Shalom Baranes Associates; Carr’s residential development partner, Insight Property Group; local media and others. 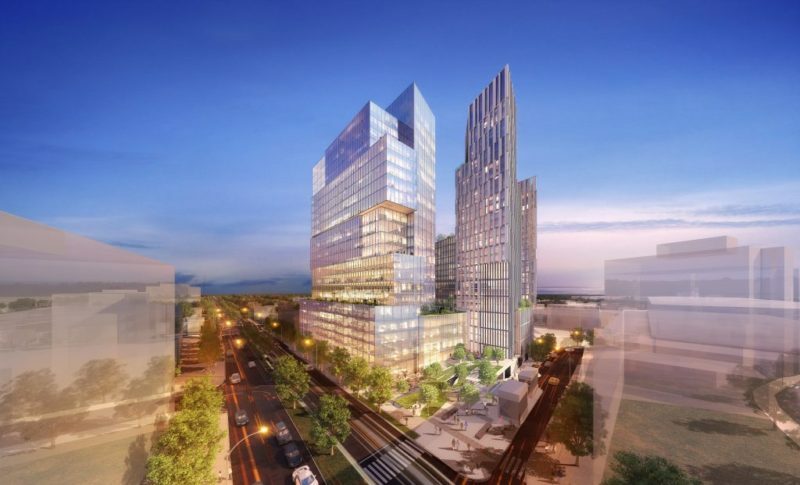 Carr Properties was also joined by WTTG- Fox 5 News, a future tenant of the project, who will be moving their headquarters from Washington, D.C. to Bethesda, MD. “We’re excited Fox 5 News could join us for this momentous event, and we are thrilled to have them as a customer. Their relocation to our project is a great show of support for our project and for the dynamic Bethesda market,” said Oliver Carr, III, CEO of Carr Properties. Carr has branded the office portion of the project as “The Wilson” and the residential portion as “The Elm”. The Wilson and The Elm will sit atop the future Bethesda Purple Line Station, a new entrance to Metro’s Red Line station, and a newly constructed tunnel for the Capital Crescent Trail. These transportation amenities will collectively make this location the best transportation hub in Montgomery County. Once completed, The Wilson and The Elm will be one of the most prominent developments in Montgomery County, Maryland. It contemplates an impressive total density of approximately 937,000 SF, including approximately 360,000 SF office building with ground floor retail, two residential towers housing 456 units, and a shared above and below-grade parking facility. More information about The Wilson and The Elm can be found on our website https://www.carrprop.com/properties/the-wilson-and-the-elm/. Carr Properties is a privately held real estate investment trust focused on creating value for its shareholders through the ownership, acquisition, and development of high-quality office properties in the greater Washington area. The company currently owns a portfolio of 17 commercial office properties totaling approximately 4.6 million square feet as well as three major development properties that include: The Wilson and Elm Development in Bethesda, MD; Signal House N.E. Washington, DC 20002; and 2025 Clarendon Boulevard in Arlington, Virginia. Upon completion, these projects will add 1.2 million SF of trophy-quality office space to the company’s portfolio. The company is continuing to expand its portfolio through strategic investments in the Washington, D.C. area.